As we celebrate the season of giving thanks, your generosity is growing. $358.38 billion was given in the U.S. in 2014, surpassing the peak that occurred before the Great Recession, an increase of 7.1% over the previous year, and the fifth year in a row that giving went up. According to individual giving increased 4%, foundation giving increased 6.5%, bequests were up 13.6%, and corporate giving increased 11.9%. Reports predict that giving will have continued to rise in 2015. The following is our annual selection of some of the many thoughtful and distinguished gifts people have made in our region, a reminder that it is individuals, people, who create and sustain philanthropy. 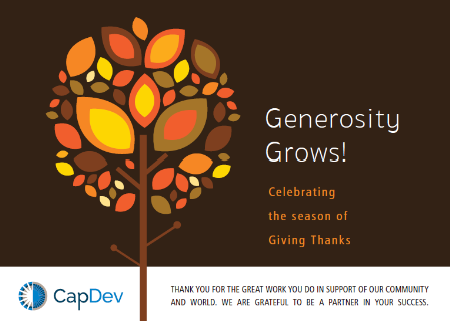 Past or current CapDev clients in italics. All gift information provided is based on research of publicly available resources.